Boy, you spend a few days away from the blogging world and look what happens. Cathie Black proves once again that she isn't ready for prime-time, making this optimistic, open-minded blogger feel more foolish and dispirited by the day. E4E pops its head out again. A popular GothamSchools blogger may or may not be a deformer-crowd shill. But I'm all better now, ready to bring you this story via Gothamist: Mayor Bloomberg has a dream. That's right. 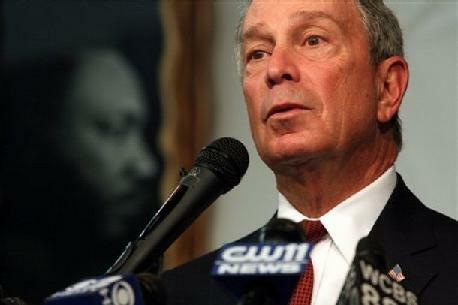 Mayor Bloomberg used a Martin Luther King, Jr. Day Celebration to validate his choice of Cathie Black for schools chancellor. Reeeeeeealllllly makes you wonder what the Reverend himself would have made of this situation. My guess is that he would have been, to say the least, unamused. Bloomberg was booed during the event, to no one's surprise. He could have reiterated his disappointment in Ms. Black, perhaps acknowledged the remark's inappropriateness during this time of remembrance of the civil rights struggle. Nope! He chose to remind the crowd how much better he knows than we the little people do. At this point, you really have to wonder if Bloomberg, Black, et al. just do not give a--well, this is a family blog, but you get my meaning--about their constituents. I used to think that all the billionaire comments were a little exaggerated. But they clearly see no need to take into consideration the perspective or the concerns of those who, unlike them, send their children to public schools, commute to work without the help of personal drivers, or park their cars on public streets. A commenter at Gothamist asked, "Is he really that self-unaware? I just can't believe anymore that he doesn't know. It's gotta be some kind of act." Well, Gothamist commenter, either he really is, or it is an act--an act for his billionaire buddies. We're stuck with this guy for three more years. This day reminds me how much poorer our country is without that voice who always spoke truth to power, who would have had a thing or two to say about dreams to Mayor Bloomberg.